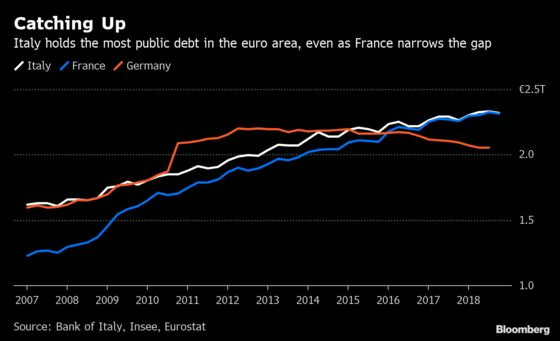 (Bloomberg) -- Italy remained the holder of Europe’s biggest public-debt burden in 2018 even after France’s rose to almost match it. France’s debt reached 2.3153 trillion euros ($2.62 trillion), just 1.4 billion euros below its southern neighbor’s. Italy’s debt as a ratio of economic output -- 132.1 percent of GDP -- is also the second-biggest in the euro region after Greece, and still much higher than France’s 98.4 percent.